Derive a CHM in Python using raster math. You will need a computer with internet access to complete this lesson and a working version of python version 3.x. Your instructors recommend the Python Anaconda distribution. You will need anaconda 3.x, git and bash to set things up. 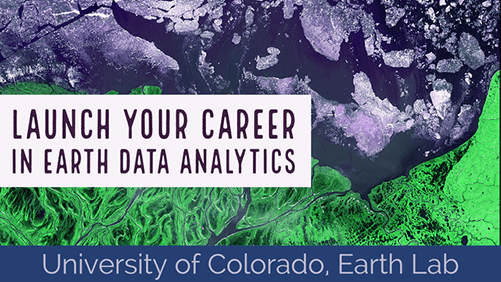 In the previous lesson you learned how to open and plot raster data. In this lesson you’ll learn how to subtract one raster from another. In this example we have a lidar digital surface model and an elevation model. If you subtract elevation from the top of the earth’s surface then you can get tree (and building) heights! To begin, be sure that you have the digital terrain model data/spatial-vector-lidar/california/neon-soap-site/2013/lidar/SOAP_lidarDTM.tif open already. You used this layer in the previous lesson. Next, open the digital surface model (DSM). The DSM represents the top of the earth’s surface. Thus, it INCLUDES TREES, BUILDINGS and other objects that sit on the earth. 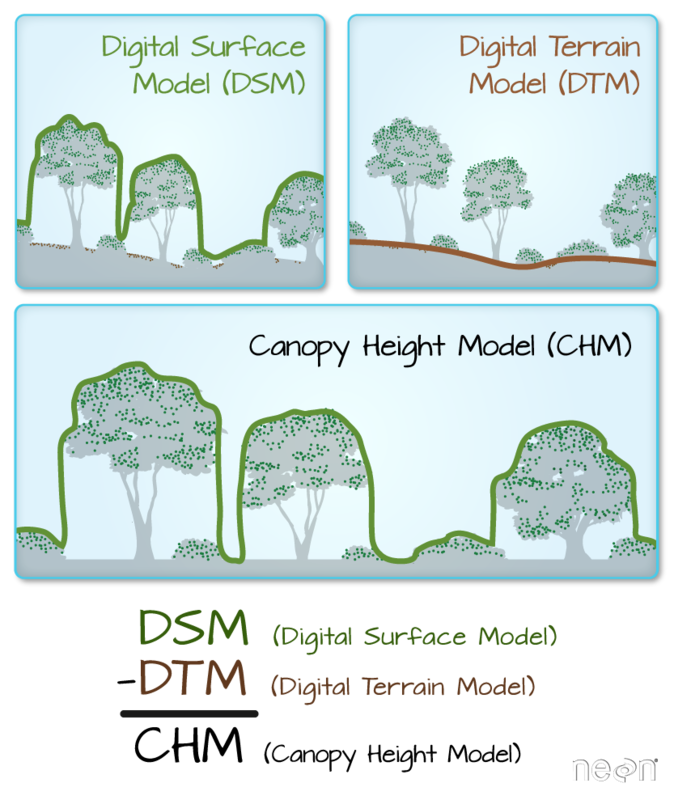 The canopy height model (CHM) represents the HEIGHT of the trees. This is not an elevation value, rather it’s the height or distance between the ground and the top of the trees (or buildings or whatever object that the lidar system detected and recorded). Some canopy height models also include buildings so you need to look closely are your data to make sure it was properly cleaned before assuming it represents all trees! There are different ways to calculate a CHM. One easy way is to subtract the DEM from the DSM. This math gives you the residual value or difference between the top of the earth surface and the ground which should be the heights of the trees (and buildings if the data haven’t been “cleaned”). Data Tip: Note that this method of subtracting 2 rasters to create a CHM may not give you the most accurate results! There are better ways to create CHM’s using the point clouds themselves. However, in this lesson you learn this method as a means to get more familiar with the CHM dataset and to understand how to perform raster calculations in Python. Take a close look at the output CHM. Do you think that the data just represents trees? Or do you see anything that may suggest that there are other types of objects represented in the data? Let’s explore your data a bit more to better understand the range of tree (and building) heights that you have in your CHM. Sometimes a gradient of colors is useful to represent a continuous variable. But other times, it’s useful to apply colors to particular ranges of values in a raster. These ranges may be statistically generated or simply visually. Create breaks in your CHM plot. The last step is option. If you want to share your newly created CHM with a colleague, you may need to export it as a geotiff file. You can export a raster file in python using the rasterio write() function. Let’s export the canopy height model that you just created to your data folder. You will create a new directory called “outputs” within the week 3 directory. This structure allows you to keep things organized, separating your outputs from the data you downloaded. NOTE: you can use the code below to check for and create an outputs directory. OR, you can create the directory yourself using the finder (MAC) or windows explorer. View the crs - is it correct? View the x and y spatial resolution. Plot the data using a color bar of your choice. Your plot should look like the one below (athough the colors may be different. Create a Canopy Height Model using the DTM and DSM from the SJER field site. Do you notice differences between the two sites? Data Tip: You can simplify the directory code above by using the exclamation not which tells Python to return the INVERSE or opposite of the function you have requested Python to run.